Patriot Memory, which recently made headlines with its new Viper line of DDR4 memory modules, has expanded this lineup with the addition of Viper DDR4 SO-DIMM memory. The new memory has been designed to run in notebooks and small form factor computers but despite its small size the Viper DDR4 SO-DIMM can be one serious performer. The key to the performance offered by the Viper DDR4 SO-DIMM memory modules lies hidden in clock speed – the new memory runs at the impressive 2400 MHz and 2800 MHz but there’s no information on the memory latency and the voltage needed. The Viper DDR4 SO-DIMM memory is available in the form of modules with capacities of 8 GB and 16 GB and in dual-channeled kits with capacities of 16 GB and 32 GB. All Viper DDR4 SO-DIMM memory modules come with a special high performance heat shield for superior heat dissipation for stable operation even in very hot days. 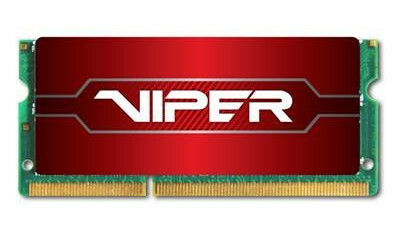 The new Patriot Viper DDR4 SO-DIMM memory supports Intel XMP 2.0 and for those of you interested in this memory we have to say that the Viper DDR4 SO-DIMM will be available for purchase on June 10. The memory will cost from USD 34.99 for a single 8 GB DDR4-2400 stick to USD 169.99 for a 32 GB DDR4-2800 dual-channeled kit.